The American moron already knew everything he needed to know: America had been attacked; the attacker was a brown-skinned Muslim currently believed to be resident in a country of brown-skinned Muslims. Afghan? Saudi? What’s the difference? And who cares? Donald Rumsfeld provided the final required piece by claiming that Al Qaida had 100,000 followers around the world and constituted a declaration of war. Morons didn’t pause to consider that they hadn’t heard of Al Qaida prior to the attack. It didn’t dawn on them that Rumsfeld may have inflated the size of the “enemy” by well over a hundred-fold. They didn’t stop to question when the religious-conservative Pashtun Taliban was conflated with the dissident terrorist Saudi group Al Qaida. Never did they ask why thousands of US troops were already resident in Saudi Arabia and other Arab countries, or how Arabs might feel about that presence. The online response was tragic but predictable. People wanted Afghanistan “bombed to a sheet of glass” (never minding that it already had been, by American and Soviet weaponry). 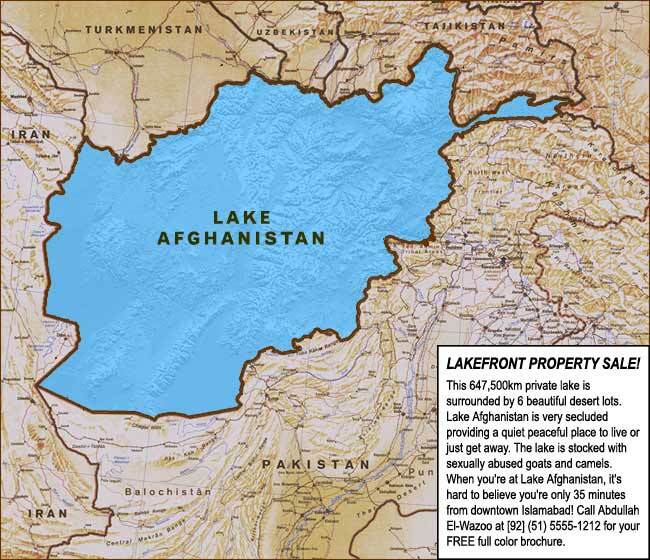 Maps circulated showing “Lake Afghanistan” in place of the country. The rage allowed the attack on Afghanistan in 2001, and continued into 2003 to allow the attack on Iraq. It was still present in 2004 when Bush was re-elected. Only in 2005 did the American mainstream begin to question the slaughter being conducted in their name – or more accurately in the names of the almost 3,000 people who had died on September 11. I’d been on the huge anti-war demo in London in February 2003: the largest demonstration ever seen in the UK. I knew that the UK mood was angrily against the Iraq war, and was turning against Tony Blair, who had committed support to Bush without the backing of the British people. I also spent a few days in Barcelona in April 2003, during the initial Iraq invasion, and the Spanish anti-war mood was even more militant – there were several protests per day around the city, including, every evening, the Argentine-style beating of pots and pans to make noise that echoed across Barcelona. While over 60% of Brits opposed the Iraq War, in Spain opposition topped 90% (but José María Aznar, the Prime Minister, had also committed his support to Bush). On March 11 2004, 10 bombs exploded on four trains in Madrid, killing 191 people and injuring almost 2,000. As with America’s attacks, the initial response was shock and outrage. But from there, the two cultures couldn’t have behaved more differently. In the following two days, an estimated 11.4m people (28% of Spain’s population) came out onto the streets to demonstrate not just against terrorism but against war as well. This was the striking contrast between the US attacks and the Spanish attacks: Americans shouted for vengeance, the Spanish called for peace. The war party have smeared the Spanish people as cowards for voting Aznar out of office a few days after the Madrid bombings, but this doesn’t reflect reality. The Spanish people didn’t turn on Aznar immediately after the bombings, but after he was caught lying about the perpetrators; he had blamed the domestic terrorist group ETA, thinking that would aid his electoral chances, although he’d already been informed that the attacks had most likely been committed by Al Qaida. As someone who has visited both Spain and the US many times, the difference in responses isn’t a surprise. The US is quite obviously an overall more frightened and more violent society than Spain. As to why the two cultures are so different? My guess is that Spain is more advanced in terms of its relationships with the rest of the world. The Spanish Empire had mostly died by 1900. The British Empire faded in the 1950s and 1960s. In 2001, the US Empire was at the height of its powers (though in 2011 it appears to be in the early stages of decline). Post-imperial societies seem to have stronger belief in fairness and the rule of law, while imperial societies clearly have much to gain by ignoring it. The US, perhaps, will go through a re-evaluation of its role in the world as it loses the impulse to control everything, everywhere. And if Spain and the UK are anything to go by, this will create a better America.